For sale is this first quality Gildan ultra cotton 100% 6.1 oz tee shirt. Due to it's 100% cotton knit, it does shrink about 3/4" in width and length in the first washing. It retains it's color and shape wash after wash. 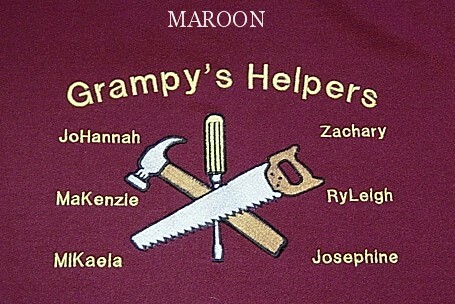 I will embroider this neat tool design on the front chest adding the children's names. The design example measures 8.8" x 6.7". I have used "Grandpa" but you may change it to whatever name you want. I will adjust the thread colors according to the color shirt you purchase. The price includes up to 4 names, each additional name is $2.00. Have a special Grandpa in your life? Why not let him know with this shirt specially made for him.